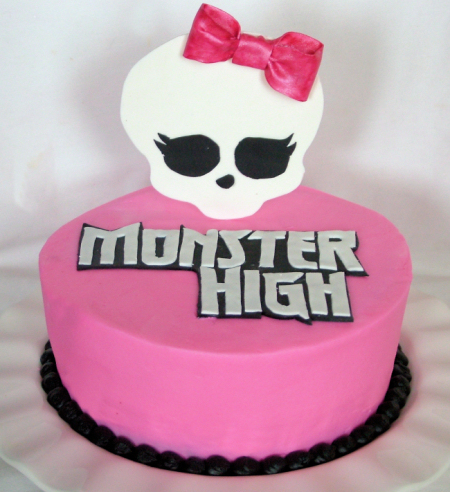 And onto Monster High cake number 2! This cake was for her family party. She found this one when searching for ideas online. 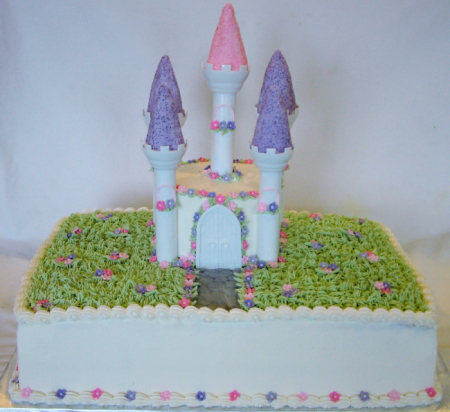 This cake is a 6″ and 8″ round tiered cake, iced in buttercream with fondant accents. 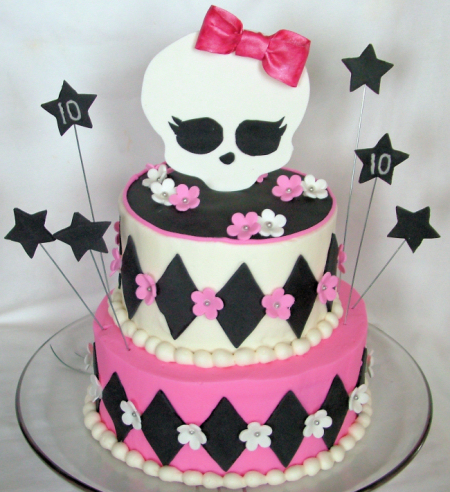 This is the same skull from her other monster high cake. This weekend was a busy one here as we celebrated my daughter’s 10th birthday with her friends and family. 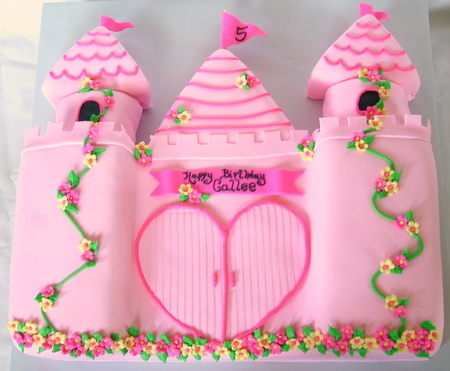 This first cake was for her friend party. She picked out the design and I just went with it 🙂 She loves Monster High so you will see a theme with this cake and the next 2 posts. This cake is an 8″ round and the skull is done out of gumpaste, the wording is fondant. Tonight my husband and 2 daughters are off to a father/daughter dance at the school. This is their 3rd year going and they have such a great time. It is run by their Girl Scout troops. This year, their leaders asked me to make a center piece cake for the event. The theme? 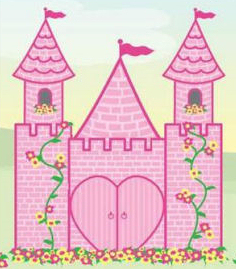 One Starry Knight…they wanted a sheet cake but a castle with pink and purple. Fun! This cake is a 2 layer 12×18 cake in buttercream icing. 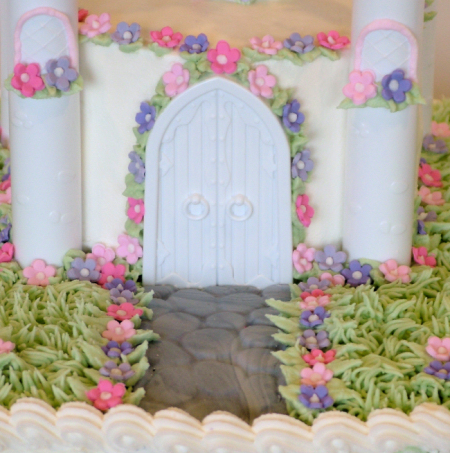 I put a 6″ round cake on that and used some of Wilton’s castle set pieces to finish it off along with lots of small fondant flowers. The walkway is fondant and made with a impression mat I have. I hope all of the girls tonight love it! So I made that elephant cake last week and now this week I got to make some fondant dogs! 🙂 I love making these little creatures. They can be time consuming but they are so fun and so cute. This 10″ cake was for a girl who likes dogs and purple! Everything is buttercream except for the dogs, which are fondant. This week I made a cake for a little girl turning 1. She loves elephants so we wanted to incorporate an elephant into the design. This cake is a 6″ and 10″ round, BC iced with fondant accents. 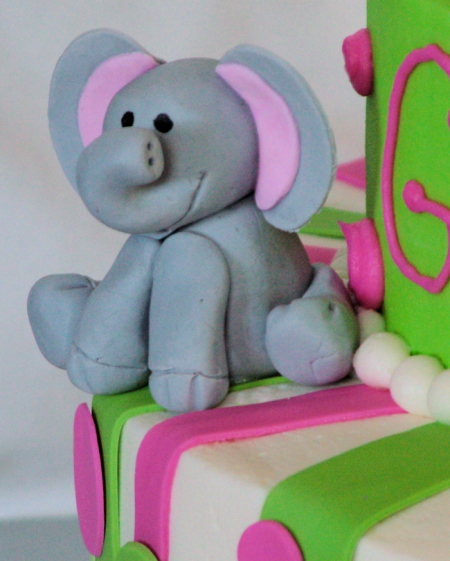 The elephant and bow are fondant. The top layer is Grace’s “smash” cake, so we kept the dots just icing on that layer. 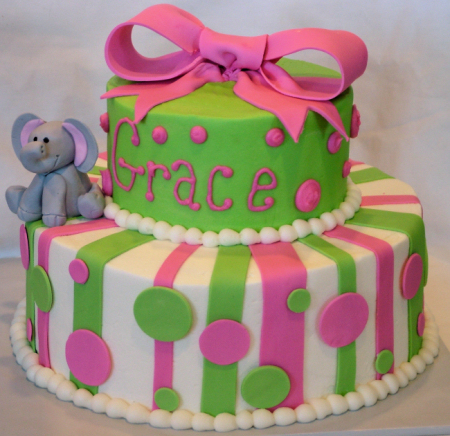 Happy Birthday, Grace! 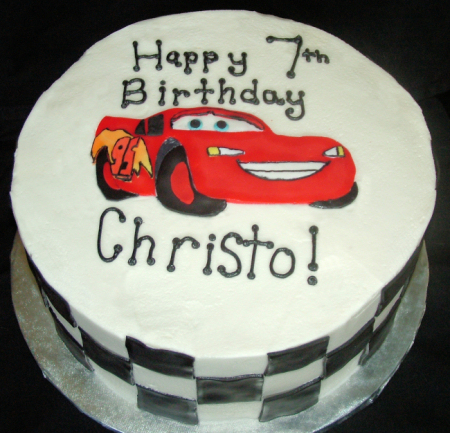 This cake was for a friend’s little boy who turned 1 this past week! 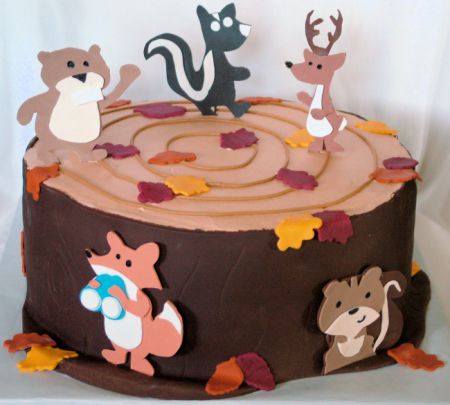 She wanted a woodland animal theme and some fall thrown in too. She had made an adorable Happy Birthday sign using a Cricut machine and she sent me pictures. So I used those pics to duplicate the animals on the cake in fondant! And they are all gathered around a “tree stump”. The cake is a 12″ round cake, iced in buttercream and then wrapped around the sides with fondant for that tree trunk look. This weekend we celebrated my niece’s 2nd birthday! 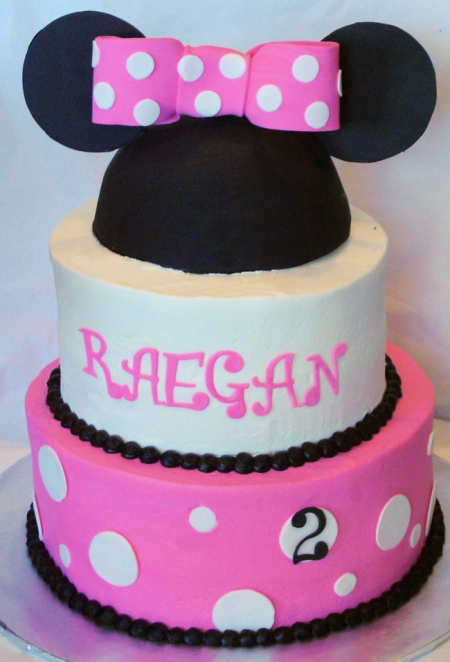 She’s a big Minnie Mouse fan so that was the party theme. And my job, of course, was to create her a cake to go with it. 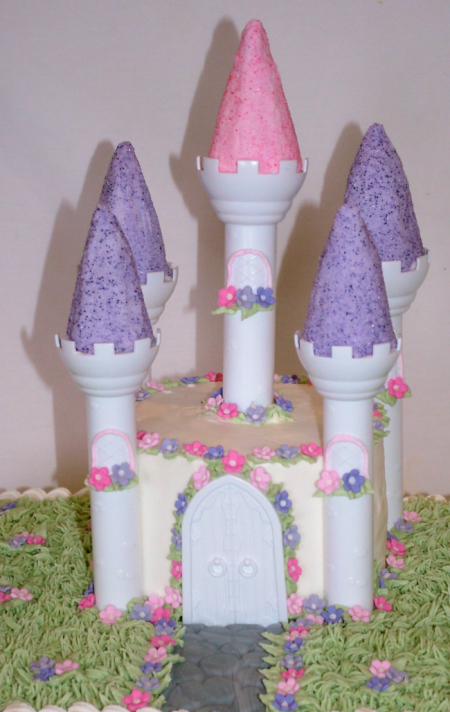 This cake is made up of 10″ and 8″ tiers. The mouse “hat” is cake baked in a Wilton ball pan (just baked one side). I then covered it in fondant. The ears are made of a fondant/gumpaste blend, as is the bow. This weekend we are celebrating the 1st birthday of my little cousin. Hard to believe a year has gone by already! She’s so precious and such a blessing to her parents and our whole family. I created the cake for the big day based on the invitations and the party decor. First up is the main cake. 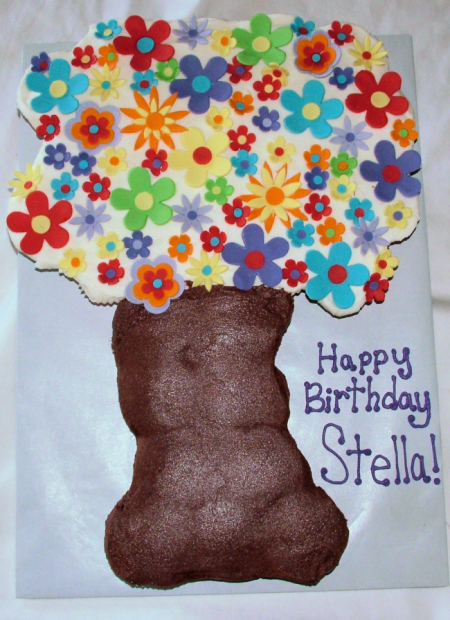 This is a cupcake cake made to look like the tree from the invitation (the pic of the invitation is below). 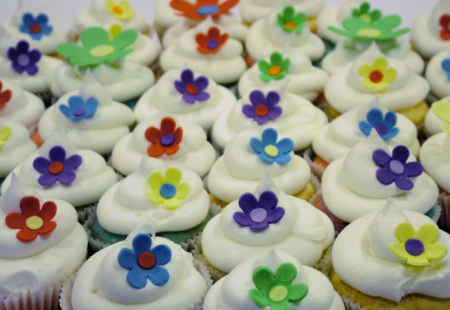 The leftover cupcakes I iced and threw a flower on to go with them. All of the flowers are a fondant/gumpaste blend. And finally, what’s a 1st birthday without a smash cake? 🙂 The party decor was Owl based. 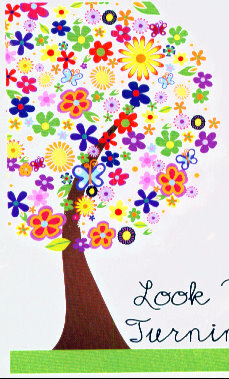 Super cute design. 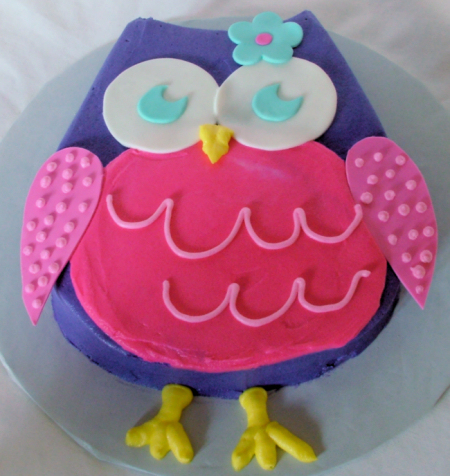 So I replicated one of the owls for the smash cake. 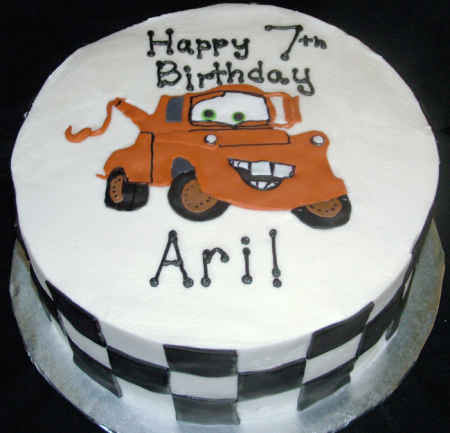 The cake is primarily buttercream (to make it baby friendly) with just a couple fondant accents. 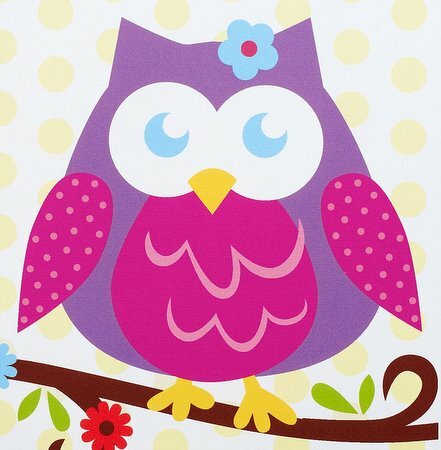 I love this cake…this owl is just so cute to me. A pic of the party napkin is below the cake pic. You know its been a busy summer for me when I forget to post cakes I did last month! These were done in the weeks leading up to our 2 week road trip vacation so editing & posting pics was sometimes left on the sidelines. I was looking for another pic today and ran across the pics again. So here they are. 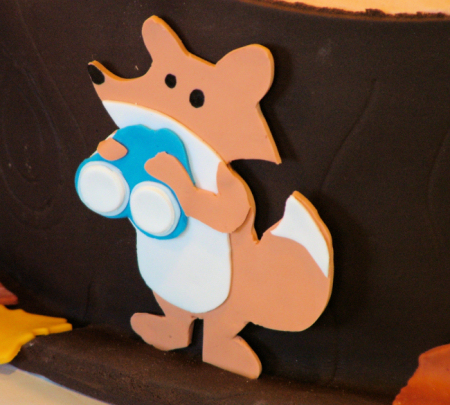 These cakes were 10″ rounds, iced in buttercream, and withe fondant accents.